The Bournemouth & Poole College is the leading Apprenticeships provider in Dorset. Apprenticeships combine learning with on-the-job training and are a cost-effective way for you to fill skills gaps and build a skilled workforce. They are proven to improve productivity and staff retention while helping businesses to stay ahead in an increasingly competitive environment. Apprenticeships aren’t just for traditional trades such as plumbing and bricklaying and can be tailored to your business. They also cover emerging roles such as digital marketing, cyber security and electronic engineering. Companies such as Sunseeker, Cobham and Redweb reap the benefits from employing apprentices through the college. Why not see what some of our employers think. By employing an apprentice, you're ensuring that you develop your future business around a loyal and motivated staff who are trained to the latest industry standards. Working with almost 2,000 businesses and approved as a main provider on the Register of Apprenticeship Training Providers, we have developed a highly effective and easy to use approach that ensures you find the perfect candidate. We offer a free Apprenticeships support service which includes a dedicated Recruitment Team to help you carefully select high-calibre and eager apprentices for your business. Almost 2,000 apprentices study with us every year, so we understand what students must do to develop and complete their Apprenticeship. It means we're also on top of the latest rules and regulations, so we can guide you through the process and advise you about any changes to legislation. 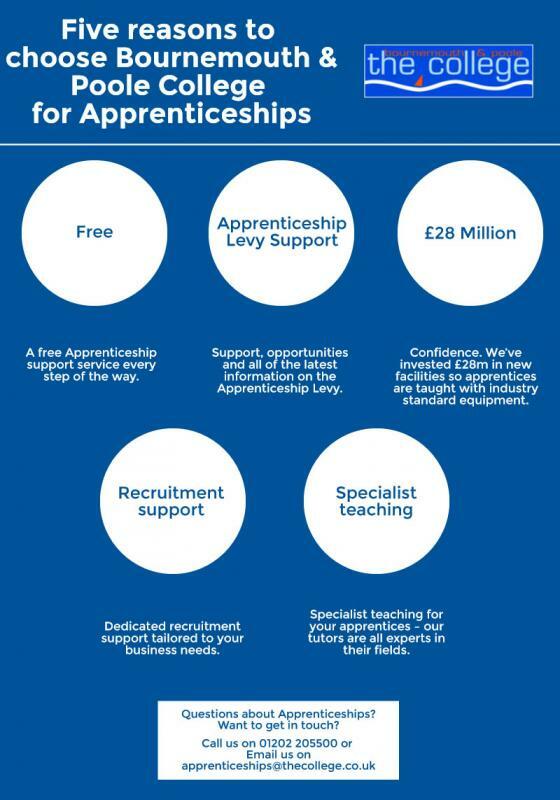 That's reassuring to know with the new Apprenticeship Levy. So contact us to find out how Apprenticeships from Bournemouth & Poole College can bring real benefits to your business.